Temperatures are cooling down, and yes, you’ve guessed it, that means a big bowl of comforting soup! Aren’t soups the perfect cold weather food?! 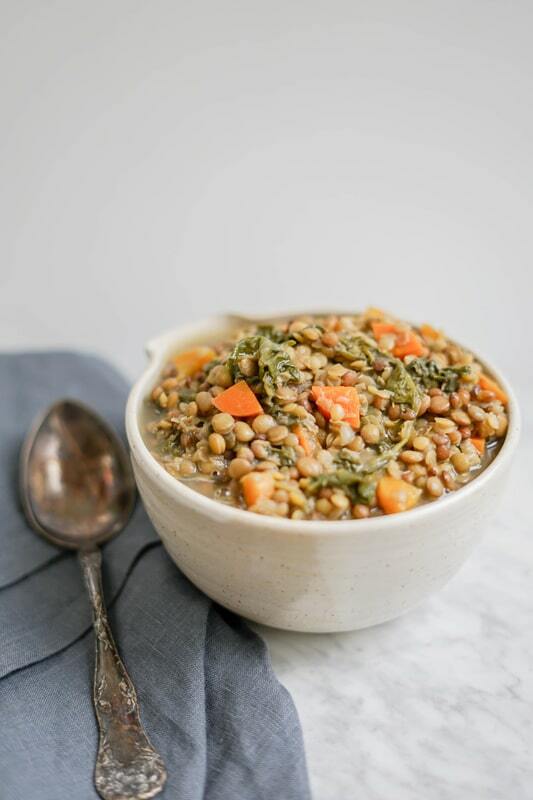 This Simple 3 Lentil Soup has been a favourite in my house for many years now. It’s very filling, so comforting, tasty, and with 33 g of proteins per serving, along with fibre, vitamins and minerals, this bowl is packed with nutrition too! 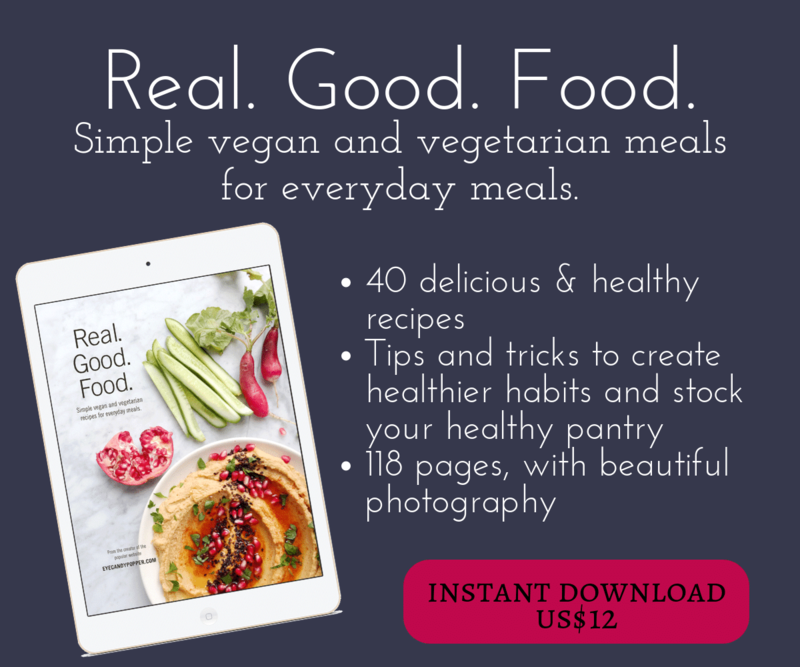 This recipe only has a handful of ingredients, is naturally vegan and gluten-free, and you can adapt it based on what you have in your fridge! The carrots could easily be replaced with cubed sweet potatoes or butternut squash. The kale can be replaced with spinach, or Swiss chard. 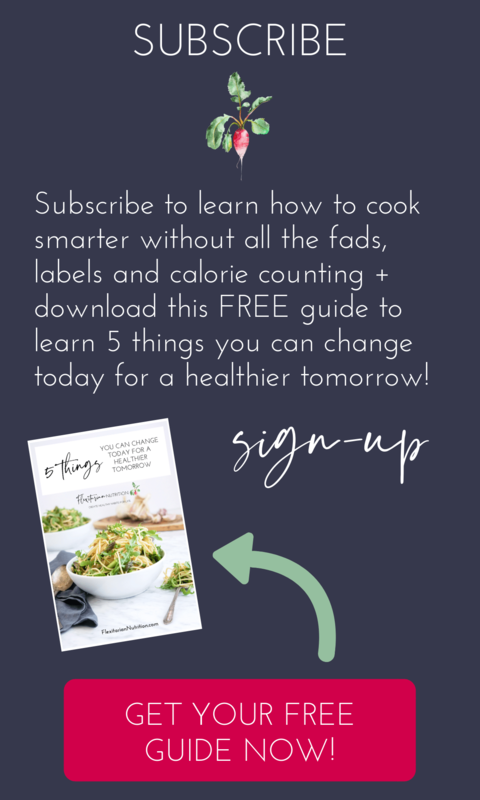 It’s a nice way to add extra nutrition to your soup, and it’s ok to use a quick shortcut and use those packages of pre-washed baby spinach or baby kale! It’s a great shortcut on a busy weeknight, and it allows you to quickly add some extra greens to your soup. More nutrition and more flavours. Yum! And if you only have 1 or 2 kinds of lentils, just use more of what you have, it’ll tastes just as good. I usually try to serve my soups with a green salad on the side and a homemade garlic toast on multigrain bread to round up a full balanced meal. You can use vegetable broth or chicken broth if you eat meat (just make sure it’s organic), it’ll taste just as delicious (I’ve done it with water and some spices too). 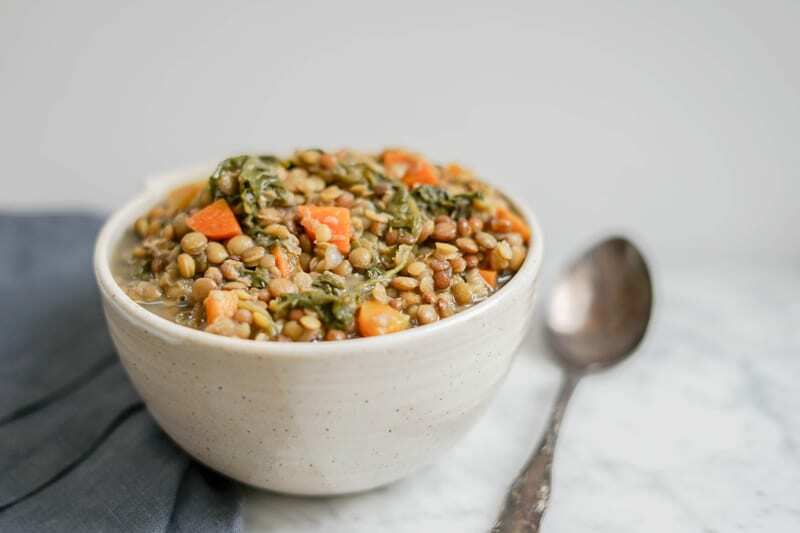 This Simple 3 Lentil Soup is great to make on a weekday because it doesn’t take long to make, a few minutes to mince the onion and slice the carrots, and then it simmers without supervision for 20-25 minutes, giving you plenty of time to make a green salad, dressing and garlic toasts. 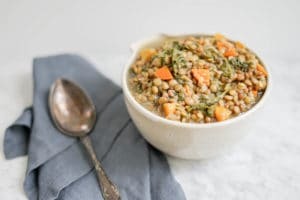 Looking for more lentil soups? Check out this Thai-inspired Sweet Potato and Red Lentil Soup, or this quick Carrot and Red Lentil Indian-Style Soup. 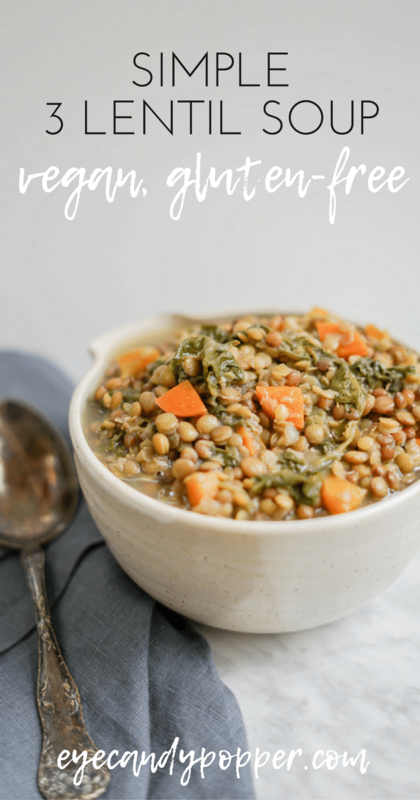 A comforting simple 3 lentil soup recipe, made with a few ingredients in about 30 minutes! In a large soup pot, warm the oil on medium heat. Cook onion for 3-4 minutes, add carrots and cook for an additional 3 minutes, add garlic and cook for 1 min, add kale, mix and cook for 1 more minute. Add the lentils and broth/water, mix, cover, bring to a boil then reduce temperature to medium-low or low and let simmer, covered, for 20-25 minutes. Add salt to soup, mix and serve. This soup is so flavourful, and if you have leftovers the next day when you warm it up it is even more delicious! That is so true! Thanks for sharing! We just cannot resist these type of soups! And here you used three kinds of lentils: the red, the green, and the French, plus some greens which can be easily adjusted to what we have. So nutritious but also delicious! A perfect weeknight meal for these colder months. hehe I’ll send you a bowl 😉 Yours sounds delicious too, I love a bit of tomato chunks in soups. I love that lentils are so quick to cook, but appreciate your reminder about pre-soaking them. I also appreciate those pre-washed greens. They’re such a timesaver! I’m pinning your lovely recipe. Thank you Maria, it really is comfort-in-a-bowl! What a beautiful soup — truly the definition of plant based comfort food! My Mom loves lentils, but I haven’t actually worked with them much. Pinning this for future reference! Thanks for another great dish, Gabby! Like many kids, I used to think lentils were bland and not appealing, but now I love them! So versatile. Give it a shot, you won’t regret it! That little bowl is so pretty, Gaby. I don’t think I’ve ever used three types of lentils in a soup, hah! It’d be really nice to have those different textures, though, great idea. Such a great weeknight meal. Isn’t it? I love that little bowl! Thanks! I love mixing lentils for exactly that reason, it’s nice to have different texture. Lentils make such wonderful meals! Like the simplicity and heartiness of this soup. Thanks! Lentils are pretty awesome!